Scottsdale has become one of Arizona's top resorts and tourist locations, known throughout America for its superb golf courses and breathtaking scenery. Close to Phoenix, Scottsdale features many excellent art galleries, gift shops and museums, centered around Old Town Scottsdale, a historic shopping district. 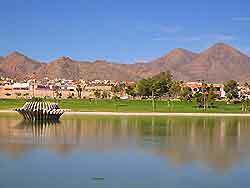 Scottsdale is also known for its vast Taliesin West complex of organic buildings created by Frank Lloyd Wright in 1937, and Scottsdale is situated close to the magnificent Valley of the Sun, Tempe and many other tourist attractions in Arizona. Tourism is becoming an increasingly important part of Scottsdale's economy and the city's main tourist information center is the Scottsdale Convention and Visitors Bureau, which can be found on the North Scottsdale Road. Home to a vast array of tourism information about sightseeing opportunities and excursions throughout Scottsdale, the center offers leaflets about specific tourist attractions and tourism in many local districts, including the 5th Avenue district, Old Town Scottsdale, the Main Street Arts area and Scottsdale's Marshall Way Arts district. 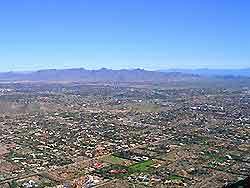 The city has many beautiful homes with an excellent selection of Scottsdale Real Estate. There are also numerous hotels and lodging options in the area, providing affordable accommodation at all levels, including a number of golfing resort hotels. Many hotels can be found in central Scottsdale and also along 5th Avenue, East McCormick Parkway, North Scottsdale Road, North 77th Street and East Raintree Drive. 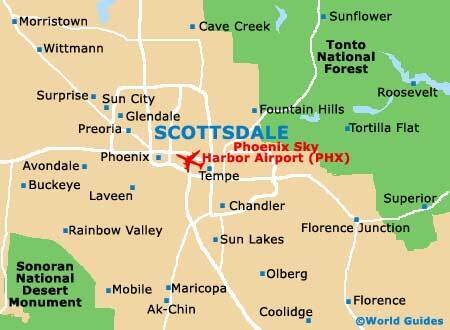 More information about Scottsdale Hotels. Scottsdale has numerous popular tourist attractions, including Scottsdale Stadium - regularly hosting sporting events, including popular baseball matches and major cultural events; Castles -n- Coasters - a small theme park with a fast rollercoaster, four 18-hole miniature golf courses and other exciting rides; Crackerjax - a popular fun park in Scottsdale, with three miniature golf courses appealing to all skill levels; Taliesin West - a renowned architectural school with guided tours, built in 1937 by reputed architect Frank Lloyd Wright; and Phoenix Zoo - a vast zoo, housing more than 1,000 animals in large, naturally landscaped enclosures. Other main tourist attractions in Scottsdale include Old Town Scottsdale - home to a number of the city's most historic landmarks, including Los Olivos Mexican Patio, the Rusty Spur Saloon and Cavalliere's Blacksmith Shop; Chaparral Park - boasting scenic views, a large lake suitable for fishing, a swimming pool, playground area and sports fields; Scottsdale's McCormick-Stillman Railroad Park - popular with children in Scottsdale, featuring several large locomotives on display; Pinnacle Peak Park - offering hiking trails, horseback riding, rock-climbing and other recreational activities; and Vista del Camino Park - featuring more than 70 acres / 28 hectares of stunning scenery, including lakes, playgrounds and sports facilities. 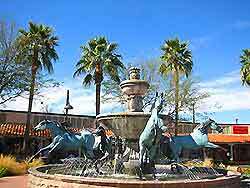 More information about Scottsdale Tourist Attractions and Scottsdale Landmarks. Some of the best museums and art galleries in Scottsdale include Arizona Science Center - always popular with children of all ages, with many interactive exhibits and exciting science information; Scottsdale's Heard Museum North - a comprehensive museum full of historic information about Native American culture; the Mesa Southwest Museum - one of Scottsdale's most popular museums, with animated dinosaurs, skeletons and a pre-Columbian temple; Scottsdale Historical Museum - located in Scottsdale's first schoolhouse, with detailed information about the local heritage of Scottsdale; the Arizona State University Art Museum (ASU) - an innovative gallery, known for its impressive architecture; the Phoenix Art Museum - a huge museum displaying works of art from all over the world; and the Scottsdale Museum of Contemporary Art - a particularly enjoyable art museum, boasting a number of rotating exhibitions and contemporary art works. More information about Scottsdale Museums and Scottsdale Art Galleries. Tourist attractions located near to Scottsdale include the Casa Grande Ruins National Monument - one of the largest prehistoric structures in North America, close to Scottsdale; the Apache Trail - featuring some of the most breathtaking scenery in the whole of America; Florence - a historic Western town, just a short distance to the south of Scottsdale; the Goldfield Ghost Town - an authentic reconstruction of an 1890s gold mining town with many period buildings and saloons; the Historic Sahuaro Ranch - with a host of information about the agricultural past of Scottsdale; and the Hoover Dam - a popular trip for many visitors to Scottsdale and Arizona, with a visitors' centers and awesome views of this historic engineering feat. More information about Scottsdale Attractions Nearby.